Lydia (also spelled as Libia) is a young, frail girl exclusive to the 2003 anime series. A sickly and insecure young woman, she falls victim to the terrible "Fossil Disease" ravaging her small town. Her fiancée, Lujon, is quick to temporarily heal her with the Red Stone on his ring. However, Lujon had fallen in love with the stranger who had given him the magic ring, Lust, causing him to leave her at the altar on their wedding day. 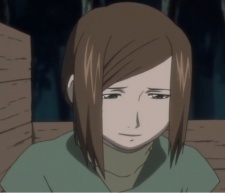 Lydia tries to find him again after another outbreak of the Fossil Disease in her village, not knowing that he'd left the village looking for Lust again as well as another stone for just that reason, and meets up with the Elric brothers and Winry Rockbell after they rescue her from a gang of thugs. She tells them her story as they travel back to her village in search of Lujon. Once there, they discover that everyone has succumbed to the disease. She runs into the village to find his rock-like dead body on the ground (who had been killed by Lust before becoming fossilized). The Elrics and Winry catch up, only to find her dead in his arms, also fossilized.